For one night only, the exposé of the IRS will hit theaters nationwide! Do you trust the IRS or do you believe it to be an abusive government agency used by a leftist White House to harass and intimidate private citizens and conservative organizations? 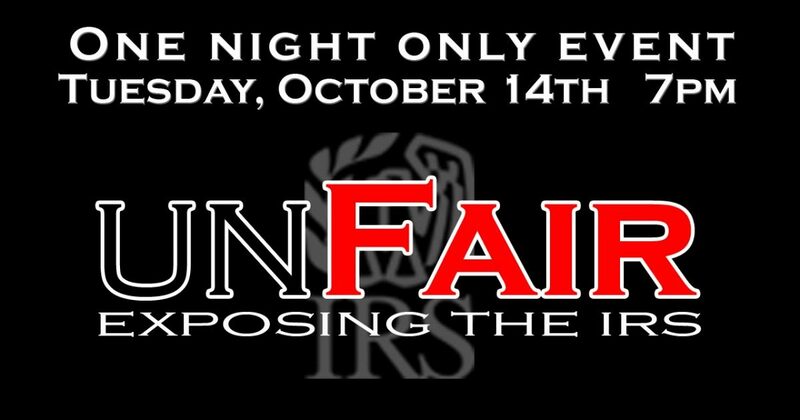 If the latter is the better description of how you feel about the IRS, you will want to watch UNFAIR THE MOVIE. This ninety minute documentary will shed light on how the IRS is robbing Americans of their liberties and bullying family, religious, charitable, and civic organizations that refuse to toe the line of liberal orthodoxy. Executive produced by John Sullivan, producer of the hit documentaries “2016: Obama’s America and “Expelled: No Intelligence Allowed,” UNFAIR THE MOVIE tells factual stories of betrayal, corruption, intimidation, and deceitfulness reminiscent of Nazi Germany, the former Soviet Union, and Orwell’s 1984. This hard-hitting documentary is directed by Judd Saul, an award-winning director and activist whose documentary, “Frag,” changed the video gaming industry. Nationally syndicated talk show host, Craig Bergman, is the producer. UNFAIR THE MOVIE debuts for one night only on Tuesday, October 14th at 7:00pm. Tickets are available at http://www.fathomevents.com/event/unfair. For a sneak preview of this ground-breaking documentary, view the trailer at http://www.unfairmovie.com. You know about IRS scrutiny of conservative organizations, improper document leaks, brutish gift tax enforcement, distortions and denials before Congress, and Lois Lerner’s “lost” emails, but these things are only the tip of the iceberg. To get the full story you will need to watch UNFIAR THE MOVIE. Don’t miss this revealing documentary. Becoming knowledgeable about government abuse is the first step in fighting back. Dr. Goetsch is a retired college Vice-President and professor of business and political science, a business consultant, and a widely-recognized public speaker. He is the author of more than 70 books on leadership, management, business, and political commentary.